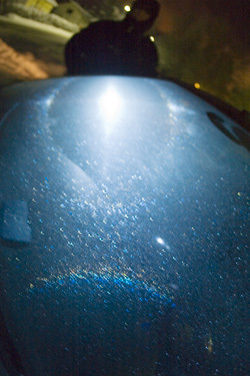 Last night we were observing a halo display on a car windshield. We will return to this later when all photo and video material is processed. Thanks for posting the announcement Marko. We indeed do have so many gigabytes' worth of data that it's going to take a while. It was a complex display with some twists in it. Waiting for more photos and videos. Guys, you surprise us with something every week!!! I just went through some of the video material and spotted yet another halo form in there. But I presently have no idea what it is. This will take a while, sorting, processing and uploading. I saw that once on my car a couple years ago and at first I thought I was seeing things so I moved back and forth and it moved with me and I realized I was seeing a windshield halo!!!!!! One discovery after another!! Michael, what halo forms did you see? Do you have any photos? I have almost 5 gigabytes of video and been trying to upload some 200Mb clips. They take an hour to upload only to give an error message in the end. Exasperating. I'll concentrate on still images for a while. Wow. Team Tampere is seeing halos in everywhere :) Im wondering what might be the next place... hmm.. Also i had windscreen display on the last week, when i was leaving from the evening shif. I think halo was CHA, but i cannot be sure. I was also driving - leaving my place - but turned back after 100 meters to think on the parking lot what to do with it. There were no bright lights so I tried the led light. It worked good. Then I called Luomanen to come to see and video the display. What I for one my vehicle's windshield was parhelia and parhelic circle. I was unable to photograph it because I had to leave for work. I also once saw a subparhelia on a car. As far as the first rare halos go for me this year well I got 9d halo. Sounds like you had a good display there Michael. Of course, windshield and car roof halos have been know for some time already. I think Walt has watched plenty. I have seen a couple of cases too (one with Walt in Fairbanks), but nothing like this one. In 3 December 1986 in Finland, Kuopio, Juhana Hakumäki saw 9, 22 and 24 halos on window. Pekkola, who wrote about this in our newsletter, comments that he hopes for photo next time. Well, as far as I know, photos of halos on window or windshield in general have never come up in public, although one or two people probably have taken photos. So it is the time to present some. I have seen several times 22 halo and at least once a 46 halos on my car windows. One 22 halo on window I had online earlier. I should put my halo photos back online. If I had a backyard, I would be setting up a large glass pane there. Who knows how many a great display such an arrangement would bring during the winter. Jarmo, it will be interesting to see your images! We will soon have a lot of stuff online. Some of it is really complex and I still have no idea about one of the halos. Marko, that really is a good idea and I have already mapped some local sources where I could get such a window. Yes, you should get halos on that window pane. There is still plenty of winter left, so why not experiment.